For me, it’s a rare thing indeed for a game to move from total obscurity to a fixed place on my hard drive in the course of a handful of days. Admittedly, I was less-than-enthused as I first started playing this little gem from Arcen Games. 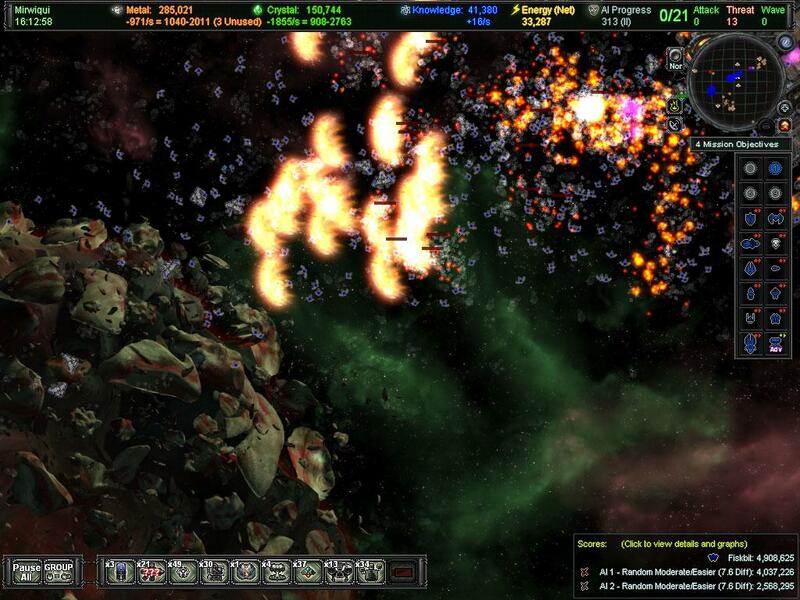 I was thoroughly prepared to slog through yet another space-based RTS, and be on way to bigger and better titles. Then, slowly, I began uncovering a depth of play that I just wasn’t expecting in a freshman game from a tiny indie studio. After a few more hours, I realized that I was not only having a blast with my initial runs through the game, I was planning many additional excursions even after my review was written. Although not for the faint of heart (or even the casual strategy gamer), AI Wars: Fleet Command is a surprising, delightful, and thoroughly engrossing RTS title. 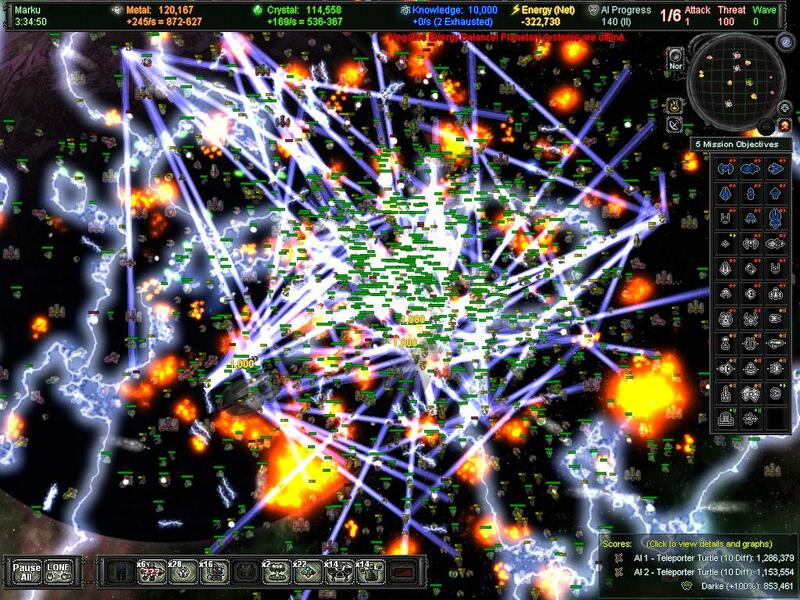 AI Wars is just brimming with innovative twists on the 4X-style RTS. First up: regardless of the number of players, from the solo outing to an eight-player mash-up, AI Wars is always Human vs. AI. At first blush, this may sound like a Bad Thing, but it works quite well. Due to this co-op only setting, Arcen dodged a huge problem with many RTS games: the need for balancing several different factions. Next up is the AI itself. In a very cool take on enemy behavior, the AI advances in difficulty and aggressiveness in direct proportion to the amount of territory the human teams take. Destroying key AI structures increases the “AI Progress” value, meaning a greater buildup of enemy forces, and a greater willingness for them to be used. The AIs themselves can be set from several different flavors at the start of a game, giving players the chance to face turtling AI, highly aggressive ones, tech-mad researchers, or some combination of the mix. Just one little change in AI setting makes for a very different game. Speaking of game setup, there are scads of options to choose from at the outset. Galaxy size and planet distribution choices are endless, with millions of possible combinations (and the ability to preserve the random seed for those who want to re-try a favorite map). AI style and aggressiveness, as mentioned above, greatly changes the challenge level of the game. In addition, there are several choices about player tech level, bonus units, and other small flavor changes. The scope of AI Wars is staggering. 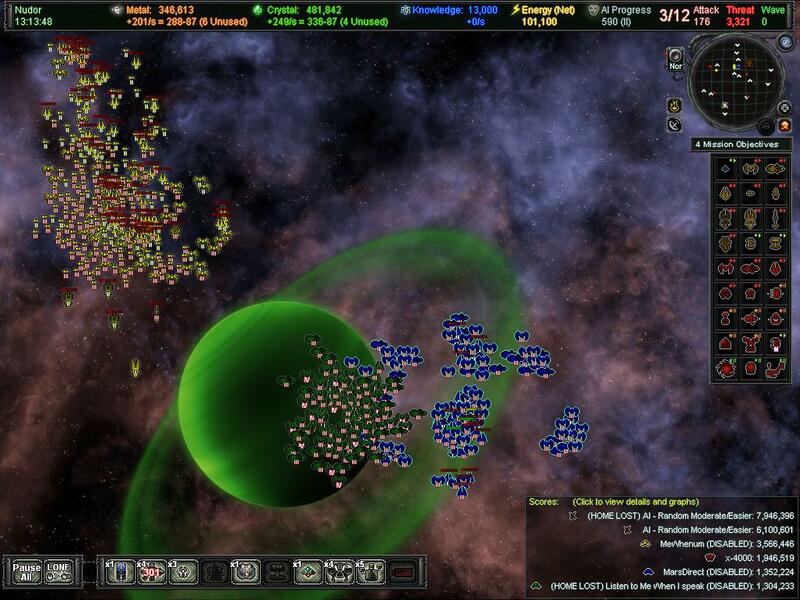 Played over a series of planetary gravity wells connected by jump points, a typical game can have dozens of active battlefronts with literally thousands upon thousands of ships slugging it out. Thankfully, the control scheme is more than capable of handling the hordes. 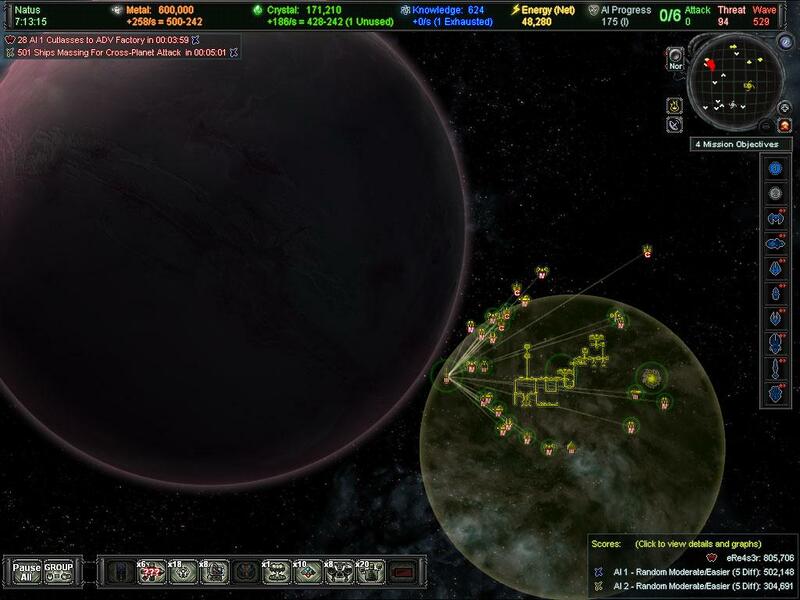 With just a few clicks, entire sweeping fleets can be sent across the galaxy. 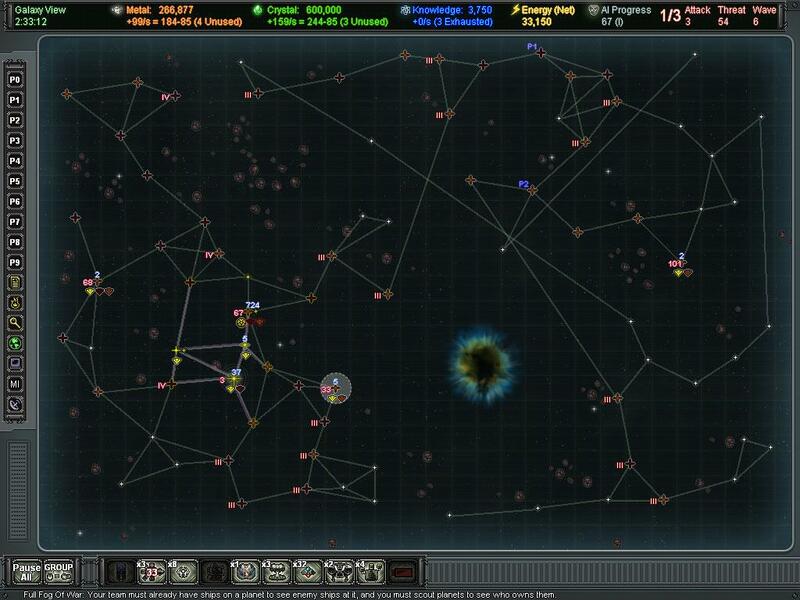 Typical RTS necessities, such as tech upgrades, resource management, and unit building, are likewise streamlined to allow players to spend much more time in big-picture decisions. The tech tree itself is rather small compared to other games of this type, but it fits well with the flow nonetheless. The strategy for playing AI Wars is something truly unique. Due to the AI Progress aspect, it’s often not in players’ best interest to completely take over every planet. Those that take that approach will soon find themselves swamped with enemy forces, since the AI doesn’t have to play by the same resource-limited rules that the players do. Careful scouting of neighboring systems, following by surgical strikes and opportunistic lunges is the name of the game. 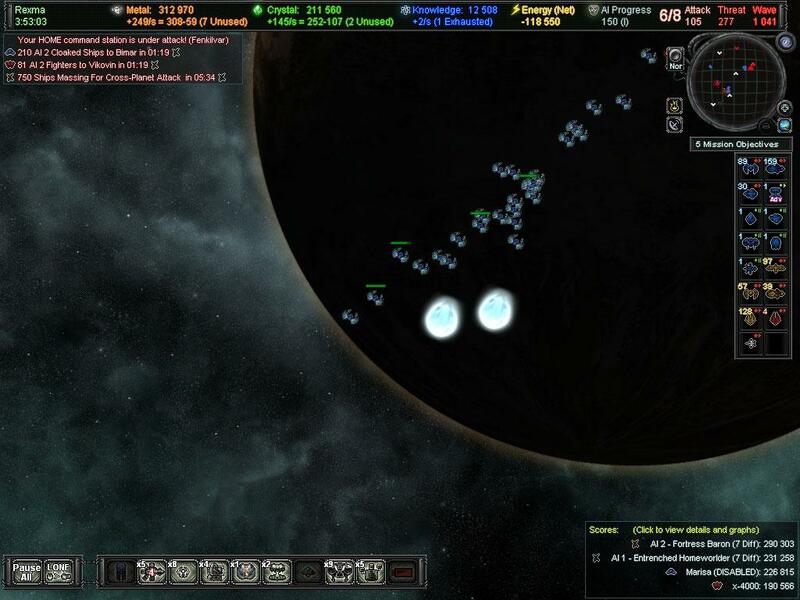 Because of this, players are often spreading out across the galaxy in a piecemeal fashion, leaving enemy forces interspersed between the growing empire. Thus, players need to find that perfect balance between careful defensive turtling and selective offense. Adding additional human teammates increases the difficulty proportionally, so the challenge doesn’t fade with the increased number of allies. 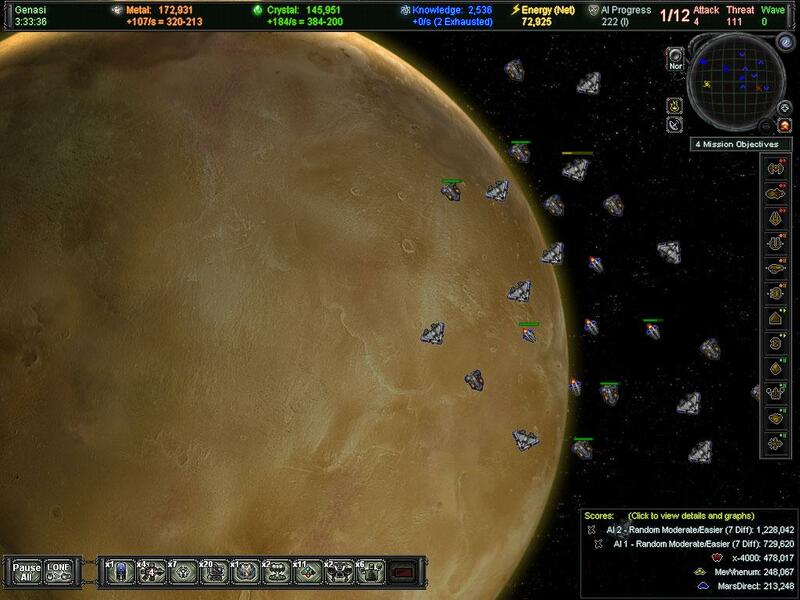 AI Wars looks good, although I did take a little while to warm up to the almost old-school style. The ability to quickly zoom in and out over massive battlefields is impressive, as is the ability for the game to visually keep everything straight. I found the background music to also be surprisingly good, since it’s often something I either just overlook or soon disable in this sort of game. The controls are solid, although they did seem just a little clunky at first. After a bit of time, however, I soon had everything flowing smoothly in my quest for human dominance. 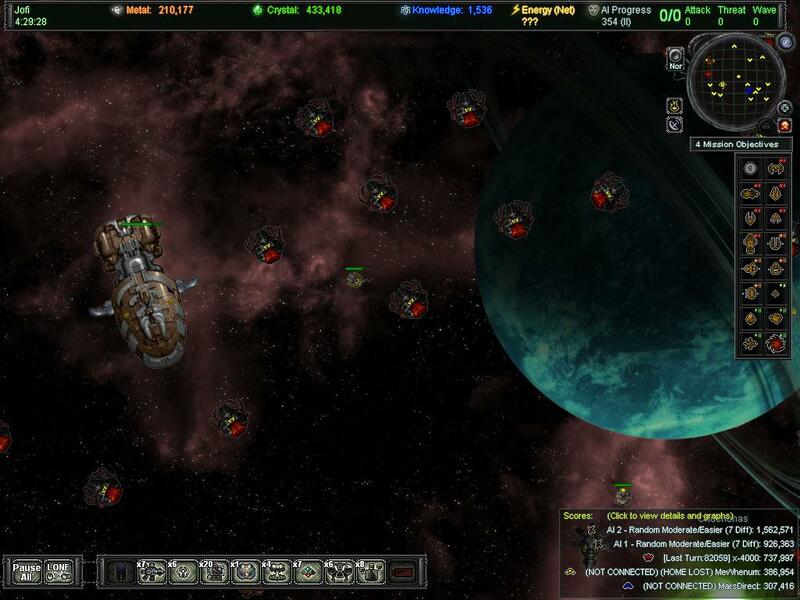 All told, AI Wars: Fleet Command is bound to be a delight to any fan of the heavier strategy titles. It’s an absolute bargain as well, and this title has the rumblings of a very strong, even if not terribly large, community support. I was pleasantly surprised by just about everything I saw in this game, and I would heartily suggest this for those wanting a meaty, unique galactic RTS romp. Although not for the faint of heart (or even the casual strategy gamer), AI Wars: Fleet Command is a surprising, delightful, and thoroughly engrossing RTS title.